Vehicles must be registered at the Vermont Department of Motor Vehicles before it can be operated on any highway. When acquiring a new or used vehicle, registration must be completed within 30 days of taking ownership. If you are a resident of Vermont and have a vehicle that you want to drive on the roads, you must register it. If you are moving to Vermont from another state, you must register your vehicle within 60 days of moving into the state. DMV issues two license plates, a validation decal showing the expiration date, and a registration card. The plates are displayed on the front and rear of your vehicle and the validation sticker placed on the rear plate. If you own a motorcycle, tractor truck, semitrailer or trailer, DMV will issue only one license plate for the vehicle. To apply for replacement plates when original plates have been lost, stolen, faded, or damaged. If your registration plates have been lost, stolen, faded, or damaged, you can apply for replacement plates by filling up Replacement Plate Application form. 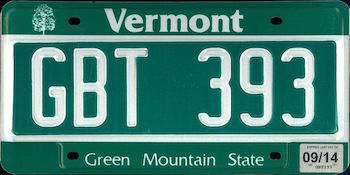 The Vermont Department of Motor Vehicles issues many different types of license plates each with its own requirements and fees. Vanity (personalized) plates can be issued to any vehicle being registered in Vermont by completing Form VD-017. In addition to the annual registration fees, an annual fee of $48.00 is required for “vanity” plates. You may transfer your license plates to a new vehicle that you buy if you trade in or sell your old vehicle. The new owner of the old vehicle must apply for new plates and registration under their name. Buying a used car in Vermont? Don’t make a costly mistake. Run a Free License Plate Lookup for your Vermont-registered vehicle! Run a Free Vermont License Plate Lookup to uncover the full-story of your Vermont-registered vehicle.